Salma Hayek Pinault (born September 2, 1966) is a Mexican and American film actress, director and producer. She began her career in Mexico starring in the telenovela Teresa and went on to star in the film El Callejón de los Milagros (Miracle Alley) for which she was nominated for an Ariel Award. In 1991 Hayek moved to Hollywood and came to prominence with roles in Hollywood movies such as Desperado (1995), Dogma (1999), and Wild Wild West (1999). Her breakthrough role was in the 2002 film Frida as Frida Kahlo for which she was nominated in the category of Best Actress for an Academy Award, BAFTA Award, Screen Actors Guild Award and Golden Globe Award. This movie received widespread attention and was a critical and commercial success. She won a Daytime Emmy Award for Outstanding Directing in a Children/Youth/Family Special in 2004 for The Maldonado Miracle and received an Emmy Award nomination for Outstanding Guest Actress in a Comedy Series in 2007 after guest-starring in the ABC television series Ugly Betty. She also guest-starred on the NBC comedy series 30 Rock from 2009 to 2013. Hayek was born in Coatzacoalcos, Veracruz, Mexico. Her younger brother, Sami (born 1972), is a furniture designer. She is the daughter of Diana Jiménez Medina, an opera singer and talent scout. Her father, Sami Hayek Dominguez, originally from Lebanon, who once ran for mayor of Coatzacoalcos, was either an oil company executive, or the owner of an industrial-equipment firm. Her paternal grandfather was Lebanese. She also has Spanish ancestry. Her first given name, Salma, is Arabic for "peace" or "calm". Raised in a wealthy, devout Roman Catholic family, she was sent to the Academy of the Sacred Heart in Grand Coteau, Louisiana USA, at the age of twelve. While there, she was diagnosed with ADHD and dyslexia. She attended university in Mexico City, where she studied International Relations at the Universidad Iberoamericana. Hayek moved to Los Angeles, California, in 1991 to study acting under Stella Adler. Due to dyslexia, she had limited fluency in English. Robert Rodriguez, and his producer and then-wife, Elizabeth Avellan, soon gave Hayek a starring role opposite Antonio Banderas in 1995's Desperado. She followed her role in Desperado with a brief role as a vampire queen in From Dusk till Dawn, in which she performed a table-top snake dance. Hayek and Banderas at the Puss in Boots premiere in Australia, November 2011. Hayek was an executive producer of Ugly Betty, a television series that aired around the world from 2006 to 2010. Hayek adapted the series for American television with Ben Silverman, who acquired the rights and scripts from the Colombian telenovela Yo Soy Betty La Fea in 2001. Originally intended as a half hour sitcom for NBC in 2004, the project would later be picked up by ABC for the 2006–2007 season with Silvio Horta also producing. Hayek guest-starred on Ugly Betty as Sofia Reyes, a magazine editor. She also had a cameo playing an actress in the telenovela within the show. The show won a Golden Globe Award for Best Comedy Series in 2007. Hayek's performance as Sofia resulted in a nomination for Outstanding Guest Actress in a Comedy Series at the 59th Primetime Emmy Awards. In 2013 Salma Hayek Produced, Jada pinkeet smith Music video, Nada se compara. In April 2007, Hayek finalized negotiations with MGM to become the CEO of her own Latin themed film production company, Ventanarosa. The following month, she signed a two-year deal with ABC for Ventanarosa to develop projects for the network. Hayek played the wife of Adam Sandler's character in Grown Ups, which also co-starred Chris Rock and Kevin James. At his insistence, Hayek co-starred with Antonio Banderas in the Shrek spin-off film Puss in Boots as the voice of the character Kitty Softpaws, who serves as Puss's female counterpart and love interest. She reprised her role in Grown Ups 2, which was released in July 2013. Hayek has been credited as a song performer in three movies. The first was Desperado for the song Quedate Aquí. In Frida she performed the Mexican folk song La Bruja with the band Los Vega. She also recorded Siente mi amor, which played during the end credits of Once Upon a Time in Mexico. Hayek along with actor Joe Anderson sing together a cover of The Beatles song "Happiness Is A Warm Gun" on "Across the Universe" motion picture soundtrack. Hayek has been a spokesperson for Avon cosmetics since February 2004. She formerly was a spokesperson for Revlon in 1998. In 2001, she modeled for Chopard and was featured in 2006 Campari adverts, photographed by Mario Testino. On April 3, 2009, she helped introduce La Doña, a watch by Cartier inspired by fellow Mexican actress María Félix. Hayek has worked with the Procter & Gamble Company and UNICEF to promote the funding (through disposable diaper sales) of vaccines against maternal and neonatal tetanus. She is a global spokesperson for the Pampers/UNICEF "partnership" 1 Pack = 1 Vaccine to help raise awareness of the program. This "partnership" involves Procter & Gamble donating the cost of one tetanus vaccination (approximately 24 cents) for every pack of Pampers sold. (Pampers diapers cost approximately 25 cents each, or about US $1,000 per child per year in the US market). In 2011, Hayek launched her own line of cosmetics, skincare and haircare products called Nuance by Salma Hayek, to be sold at CVS stores in North America. She was inspired to create a cosmetic line from her grandmother, who used to make her own facial care products. Hayek was also featured in a series of Spanish language commercials for Lincoln cars. In spring 2006, the Blue Star Contemporary Art Center in filmmaker Robert Rodriguez of Hayek as Aztec goddess Itzpapalotl. Salma Hayek and François-Henri Pinault in 2012 at the Deauville American Film Festival. Hayek is a naturalized United States citizen. She studied at Ramtha's School of Enlightenment, and is a practitioner of yoga. Hayek, who was raised Catholic, said she is not very devout anymore and does not believe in the institution [Church], but still believes in Jesus Christ and God. On March 9, 2007, Hayek confirmed her engagement to French billionaire and PPR CEO, François-Henri Pinault, as well as her pregnancy. She gave birth to daughter, Valentina Paloma Pinault, in 2007 at Cedars-Sinai Medical Center in Los Angeles, California. On July 18, 2008, Hayek and Pinault announced the end of their engagement. They later reconciled and were married on Valentine's Day 2009 in Paris. On April 25, 2009, they were married a second time in Venice. In July 2011 Hayek's husband was named in a paternity case. According to reports, Pinault is the father of supermodel Linda Evangelista's four-year-old son, Augustin James. He denied all allegations, although the reports were later substantiated. Hayek's charitable work includes increasing awareness on violence against women and discrimination against immigrants. On July 19, 2005, Hayek testified before the U.S. Senate Committee on the Judiciary supporting reauthorizing the Violence Against Women Act. In February 2006, she donated $25,000 to a Coatzacoalcos, Mexico, shelter for battered women and another $50,000 to Monterrey based anti-domestic violence groups. Hayek is a board member of V-Day, the charity founded by playwright Eve Ensler. In 2010 Hayek's humanitarian work earned her a nomination for the VH1 Do Something Awards. In 2013 Hayek launched with Beyoncé Knowles and Frida Giannini a Gucci campaign, "Chime For Change", that aims to spread female empowerment. For International Women's Day 2014 Hayek is one of the artist signatories of Amnesty International's letter to UK Prime Minister David Cameron campaigning for women's rights in Afghanistan. ^ "Today in history: September 2". MSNBC. February 9, 2006. Retrieved June 25, 2012. ^ "Sami Hayek". People. Retrieved 7 October 2013. ^ "Footlights". The New York Times. September 17, 1997. Retrieved May 23, 2010. ^ a b c d e f Lipton, James (host) (December 5, 2004). "Salma Hayek". Inside the Actors Studio. Season 11. Episode 1105. Bravo. http://www.bravotv.com/Inside_the_Actors_Studio/guest/Salma_Hayek. ^ "Salma Hayek Biography". Biography.com. Retrieved May 10, 2009. ^ Campbell, Mike. "Behind the Name: Meaning, Origin and History of the Name Salma". Retrieved March 24, 2011. ^ a b "Ariel > Ganadores y nominados > XXXVII 1995" (in Spanish). Academia Mexicana de Artes y Ciencias Cinematográficas. Retrieved February 19, 2008. ^ "Stella Adler Alumni". stellaadler-la.com. Archived from the original on October 26, 2007. Retrieved February 19, 2008. ^ "Oprah's Cut with Salma Hayek". O, The Oprah Magazine. September 2003. ^ "From Dusk Till Dawn - Salma Hayek Table Dance". ^ "Fools Rush In vs. Traffic — What's Salma's Best?". popsugar. Retrieved May 17, 2013. ^ Freydkin,, Donna (September 8, 2003). "Once upon a time, there were three unknowns". ^ "El coronel no tiene quien le escriba, de Arturo Ripstein representará a México en los Premios Oscar". El Mundo (in Spanish). November 6, 1999. ^ Tunzelmann, Alex Von (March 18, 2010). "In the Time of the Butterflies: feisty but it doesn't really fly". ^ "The 31st Annual Creative Craft Daytime Emmy Awards" (Press release). National Academy of Television. May 14, 2004. ^ "'"Prince and Salma Hayek Create 'Te Amo Corazon. PR Newswire. December 12, 2005. ^ "Outstanding Guest Actress In A Comedy Series". Primetime Emmy Awards nominations for 2007. Academy of Television Arts & Sciences. Retrieved September 13, 2012. ^ "News: Salma Hayek". Truly Hollywood. April 9, 2007. ^ Siegel, Tatiana; Andreeva, Nellie (May 15, 2007). "Hayek sits pretty with ABC deal". The Hollywood Reporter. ^ Siegel, Tatiana (March 17, 2009). "Salma Hayek joins Sandler comedy". Variety. Retrieved March 21, 2009. ^ "Puss in Boots". Internet Movie Database (IMDb). Retrieved May 29, 2010. ^ "Salma Hayek – Siente mi amor". ^ "Joe Anderson feat. Salma Hayek | Happiness Is A Warm Gun (Video)". ^ "Avon Foundation Newsroom". Avon Company. Retrieved May 10, 2009. ^ "MediaPost Publications". Publications.mediapost.com. February 12, 2007. Retrieved May 10, 2009. ^ MetaVisia. "Revista de Relojes y Joyas". Diezydiez. Retrieved May 10, 2009. ^ "Salma Hayek". Reuters. February 9, 2009. Retrieved May 10, 2009. ^ "CVS launches Nuance beauty line with Salma Hayek". The Independent (London). August 10, 2011. ^ Sandell, Laurie (April 11, 2012). "Salma Inc.". MarieClaire.com. Retrieved May 17, 2013. ^ Freydkin, Donna (August 15, 2011). "For actress Salma Hayek, it's all about nuance". USA Today. Retrieved May 17, 2013. ^ "SALMA HAYEK STARS IN LINCOLN HISPANIC ADVERTISING CAMPAIGN". Ford.com. January 22, 2002. Retrieved May 17, 2013. ^ Cantero, Monica (2006). Language and Identity in Chicano/Latino Discourse – Lenguaje e identidad en el discurso chicano/latino. LINCOM publishers. p. 33. ^ "Salma Hayek Biography". People. Retrieved August 9, 2010. ^ "Ramtha's School of Enlightenment, the School of Ancient Wisdom". 2006. Retrieved October 21, 2006. Having been a skeptic for most of my life, Ramtha has taught me about the possibilities we all have to influence reality using science to explain the mechanics in a way that finally makes sense to me. His technique on creating the day has been very effective in my life. ^ Ryan, Rosalind. "J.Lo's fitness fad and Salma's 'sweaty' hobby". ^ Savacool, Julia (April 18, 2007). "Salma Hayek: Hot Mama!". ^ "Salma Hayek, Pinault cancel engagement". Reuters. July 18, 2008. Retrieved August 9, 2010. ^ "Star-Ledger article on remarriage in Venice". The Star-Ledger. April 27, 2009. Retrieved August 9, 2010. ^ "Salma Hayek's billionare husband has secret love-child with supermodel". Yahoo!. Retrieved July 1, 2011. ^ "Salma Hayek's Husband fathered Linda Evangelista's Son". Yahoo!. Retrieved July 1, 2011. ^ Fleeman, Mike (May 7, 2012). "Linda Evangelista Settles Child-Support Case". People. Retrieved May 17, 2013. ^ "Salma Hayek". Retrieved 24 April 2013. ^ "Hayek helps groups aiding battered women". USA Today. February 14, 2006. ^ Thomson, Katherine (February 10, 2009). "Salma Hayek Breastfeeds African Baby (VIDEO)". Huffington Post. Retrieved May 10, 2009. ^ "Celebs Who Breastfeed in Public". Retrieved August 1, 2001. ^ "Do Something". Do Something. Retrieved July 15, 2010. ^ "Glamour Awards Laud Afghan Woman". Rawa.org. October 31, 2001. Retrieved May 10, 2009. ^ Harvard News Office (March 2, 2006). "Salma Hayek hosts Cultural Rhythms". Harvard Gazette. Retrieved May 10, 2009. ^ "Salma Hayek". Time. Retrieved May 10, 2009. 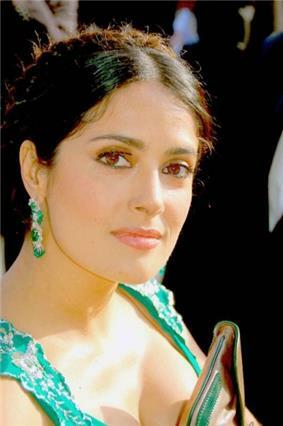 ^ "Salma Hayek to receive Legion d’Honneur in France". Toronto Star. Bang Showbiz. January 5, 2012. Retrieved August 27, 2012. ^ Galloway, Stephen (July 26, 2007). "THR's Latino Power 50". The Hollywood Reporter. ^ "Salma Hayek tops sexiest celebs list". MSNBC. July 11, 2007. ^ "Salma Hayek, Ugly Betty | 25 Smartest People in TV". Entertainment Weekly. Retrieved May 10, 2009. ^ "Muppets Most Wanted - Official Teaser Trailer". ^ "Cannes festival opens with drama". BBC News. May 11, 2005. ^ Winters Keegan, Rebecca (January 1, 2006). "People: Jan. 9, 2006". Time.